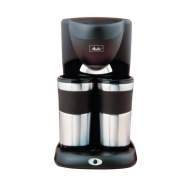 alaTest has collected and analyzed 15 reviews of Salton ME2DTMB 5-Cup Coffee Maker. The average rating for this product is 4.5/5, compared to an average rating of 4.4/5 for other products in the same category for all reviews. Reviewers really like the design and maintenance. The size and price are also appreciated, whereas some have doubts about the reliability and capacity. We analyzed user and expert ratings, product age and more factors. Compared to other products in the same category the Salton ME2DTMB 5-Cup Coffee Maker is awarded an overall alaScore™ of 80/100 = Very good quality. Best single cup coffee maker. easy to use, hot coffee, tasty, small, nothing to clean. aluminum cups not good, more suitable for single cups. If you are in the mood for coffee and don't want to make a full cup this is the machine for you,I have one it is great. Simple to use less clean-up, perfect for the one on the go.